Welcome to the second part of this interesting topic. Click here if you missed the first part from last week. Caveat! I do not want you to think that Myss Lafunky has mastered this topic, it's an on-going learning and teaching from the Holy Spirit for me and I thought to share His teachings with me to you readers and followers. 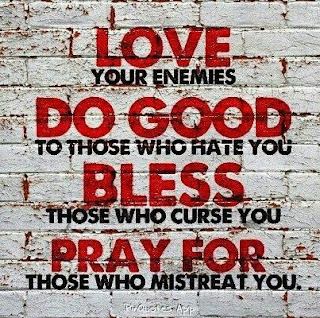 PRAY FOR THOSE WHO HURT YOU. How easy is this? Naturally, when we think of those that have hurt us or those who seek to hurt us, we seldom have positive thoughts. However, Jesus Christ wants our response and feelings to be motivated by the type of love that He has shown us. Jesus gave several specific examples in Luke 6:27-36. In verse 28, for example, He said: "Bless those who curse you and pray for those who hurt you." DON’T pretend to God when you are still hurt, pray honest and humble prayers to God. Tell God how you truly feel and tell Him to help you. REMEMBER that God will take full responsibility for whatever punishment should be administered to offenders. The Scriptures say: “Dear friends, never take revenge. Leave that to the righteous anger of God. For the Scriptures say, “I will take revenge; I will pay them back,” says the LORD. Instead, “If your enemies are hungry, feed them. If they are thirsty, give them something to drink. In doing this, you will heap burning coals of shame on their heads.” Don’t let evil conquer you, but conquer evil by doing good.” (Romans 12:19-21 NLT). DO NOT CONTINUE TO ANALYSE THE SITUATION, PUSH THE THOUGHT AWAY and LET GO. If you entertain the thought, from experience, the hurt would become fresh in your heart and it could affect your mood and how you view the person. DO NOT GIVE IT TIME. Time does not heal hurts, a conscious decision to forgive heals all wounds. Father God, please heal my heart of every hurt and help me to forgive and show love to those who have hurt me in Jesus' name.